It’s my birthday today and this post is dedicated to…. Hello, it’s my birthday today! I am choosing today to celebrate being alive another year, being healthy and having the love of friends and family around me. In this tumultuous world we live in, that is practically hitting the jackpot. There are plenty of things that are not so perfect, as in everyone’s life but I am one to see the glass half full and if there’s an ache or pain I don’t talk about, in my world, it makes it practically nonexistent, lol. So today is about happiness, love, celebration and positivity. I am taking the day (well, most of it) off to do a little celebrating in very cold NYC today. I am grateful for many things today, not the least of which is you, my wonderful loyal readers and customers…thank you, I feel so lucky to be virtually celebrating with thousands of new friends from all over the world!! To give back I am doing a little giveaway, you can read about it at the bottom of this post. I want to dedicate this birthday post to the best birthday present that I ever received…..Teddy. We had put a deposit on him 15 years ago this week and he was flown to us in January, what an unbelievable gift he was to me and my entire family. To say I miss him immensely would be a serious understatement, not a single day goes by that I don’t think of him several times during the day. Just writing this post makes me well up. It is still hard to believe he is gone and when I think of how much he suffered those last few months, it breaks my heart. He was 100 pounds of pure sweetness and goodness. When people ask if or why I will get another one, I say I am really not ready and I am not. I was in Target the other day and walked past the aisle where they sell all the cute little getups for dogs for the holidays, a place I always picked things up from bunny ears, to elf hats to even an ugly Christmas sweater one year and he always obliged:) It made me cry knowing he was gone, so there are still reminders that make his passing very real and of course very sad. But his dog bowls remain where they always have, as a reminder of the love and joy he filled our home with. Thanks for stopping in, and for following along. I treasure my blog followers, loyal customers and all those I have met on this fun j0urney of blogging. To show my thanks I want to offer a birthday giveaway! That’s a wrap for today, now am off to go and start doing a little celebrating:) Until next time. Happy Birthday Tina!!! I know that Teddy is up there celebrating with you as well. Thank you for sharing him with us. HB! It’s always exciting to see people do what they love. That includes you. Thanks for sharing. Have the Happiest of Birthdays and blessings for another great year! Tina I hope you have a day filled with many blessings. Happy Birthday and enjoy your day. Happy Birthday, TIna! Keep the fond memories of Teddy in your heart! Hi my beautiful friend as someone who knows you and knows your heart, you deserve the best today and for the record you don’t look a day over 35, keep posting pictures Teddy- we all miss him. HAPPY BIRTHDAY. Have a great birthday on this beautiful snowy day! As I read your post I have tissue in hand. Your sweet Teddy was and still a loving family member. We have Teddy’s twin and he is 14. We have health issues that we are dealing with, we hold each day as a gift. Happy Birthday, Teddy is still and will always be with you. Happy Birthday,Tina and good wishes for many more! Happy Birthday! I know that Teddy is looking down on you, waging his tail, and sending you Birthday wishes! He wouldn’t want you to be sad, especially today! It’s your special day….Enjoy! Happy Birthday Tina! I hope you have a wonderful day celebrating! Enjoy the snow, once again! A very “Happy Birthday ” Tina!! As we all get older I say we age like fine wine, the older we get the better we are! Enjoy your day celebrating the special person you are! Have a blessed and joyous year. Happy Birthday Tina! First, I’m grateful for you, your blog and your shop! I’ve learned much from “knowing” you! I’ll tell you what I tell anyone else celebrating a birthday….”Aging is a privilege denied to many”; So for me, it’s lovely hearing the gratitude from you for another year of life! As for Teddy, I lost my Angel four years ago right after Christmas. I was miserable for weeks until my husband found another “Angel” who has given us more joy and Instagram pics (ha!) than I ever thought imaginable! She doesn’t replace the other, just as much as that one didn’t replace the one who preceded her, but it most definitely helped. I hope 2018 ushers in a “new Teddy” for you!!! Teddy is simply beautiful. You blessed his life just as he blessed yours. Remember with thanksgiving all of his time with you. He will always live in your heart. I, too, lost my precious pup who was a birthday/wedding gift from my husband. Barkley was an amazing Bernese Mountain dog whom we lost to cancer at age 6 and a half. Although it has been 4 years I still get teary eyed sometimes! But eventually your heart will heal enough for a new best furry friend – we always have more love to give! Happy Birthday Tina! Thank you for sharing so much beauty with us via your blog, photos, ideas and also for sharing your heart with us today. God Bless you and Merry Christmas! Happy Birthday! May your day be filled with love, laughter, sweet memories and joy. Happy Birthday Sweet Tina, and thank you for sharing your life’s ups and downs. I, too, miss Teddy. Enjoy your day. Happy Birthday Tina…wishing you many good things to fill up your “glass half full” in the year ahead! Happy Birthday! May you have a beautiful day in the city celebrating you. Thanks for sharing Teddy with us. Happy Birthday! The Teddy pictures make me smile- thanks! Happy Happy Birthday Tina! Merry Christmas to you too. Our furry friends are missed, they are family. May you find peace, love and Joy! Now and forever. Happy Birthday, Tina! And thank you for sharing Teddy with us over the years. Seeing that sweet face always brought a smile! 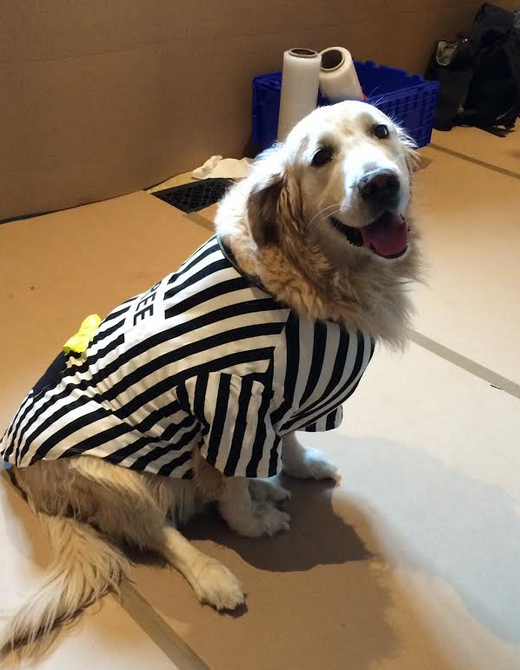 “Golden dogs” are the best! They are happy, loyal and beautiful. And did I mention smart? Happy Birthday Tina! There is nothing worse than losing the precious gift of a dogs love, ever! I too have delayed filling that void in the past, couldn’t bear to experience another loss like that, but it really is the best thing to do for yourself . . . there’s another angel out there that’s waiting to receive your love! All of Teddy’s photos have one thing in common- a happy smile! He is smiling down on you today as you celebrate another birthday. Hope it is a great one! Teddy is smiling down on you today as you celebrate another birthday. Hope it is a great one! Have a wonderful day…..just as Teddy would want! Enjoy! I know exactly how you feel about Teddy. I also had a wonderful, loving pup for 15 years. Murray was his name and he and I were inseparable. The tremendous void I feel in my life, now that he is gone, can’t be explained in words. I too, well up when I look at his favorite curling up spot on the sofa, or see a picture of him. Although he is gone, he is never far from me. My memories of him are in my heart and will remain there til he and I meet again. Happy Birthday and know your precious Teddy is with you, ALWAYS! So sorry for you loss, our dog went to dog heaven April of “16 so I know what you are going thru. Happy Happy Birthday! I hope you have a wonderful fun filled day on your birthday! I always look forward to reading your blog and seeing what is new in your blue and white world. Happy Birthday Tina! Every birthday IS a blessing, and I’m trying to convince myself that every new grey hair is a well-earned privilege. I, too try and see the little (or sometimes not-so-little) annoyances as ‘First World Problems’. So long as those I love are safe & healthy, the ‘other stuff’ can be dealt with. I’m sure you will be busy getting last-minute orders out before the holidays, but do try to take some time to have fun today! I wish you much love, joy and peace for your birthday Tina! So glad to know you and to hear the stories of your’s and Teddy’s adventures! Happy Birthday to you!! As an owner of 2 goldens, I know how they fill your heart. Happy Birthday! Thank you for sharing your positivity & generosity with us! I welled up with tears when reading about Teddy. My Flicka has been gone 3 years now and I still long for her to hop up on my lap, and feel her warm weight. We were blessed with a dog’s love, loyalty and memories. I still she her on top of sofa, pushing her nose through the curtains to see me pull into the driveway. You will know when the time is right to find a new buddy to love. Happiest of holidays. Happy Birthday! Enjoy your day in snowy NYC! Aww Tina, Teddy was a real prince of a dog! You are so fortunate to have had him in your life but he was lucky to have you as his person! Happy Birthday , enjoy your day to the fullest! I feel your pain … it took us three years after the death of our last dog to take the plunge and get another puppy. She has brought us much joy and pleasure. You will know when and if the time is right for a new addition. Hope you have a wonderful birthday and that the coming year is filled with health and happiness! My heart goes out to you over the loss of Teddy. You can tell from the pictures that he had such a sweet nature about him. Happy birthday! Extra kisses for my fur baby today in honour of yours. Ilove seeing his pic at the bottom of every post. Wishing you a happy birthday and a happy, healthy year ahead! Happy Birthday up there in my former cold home state. For those of us who love animals we understand about Teddy. I have always had pets myself & I now look at it this way – when one leaves this earth it’s making room for another one in my home. I can save another poor homeless animal. We had to put our yellow lab down 5 Years ago. He was the best ! I still miss his company and somehow when I open the back door after being gone for the day , I still expect to see him. Something happens over time, you never forget and the thought of another is tempting but you get used to the ease of coming and going and I just don’t think I have the puppy thing in me one more time. Maybe that will change when that is all I will have on my plate in retirement. My son got a puppy this past year and I have a cousin that has a chocolate lab and I am happy to be a dog Gram and Aunt and get my fixes that way. I does get easier, but you never forget the love of a great dog! Happy, happy birthday and may today be as special as you are!! Our doggies just leave a hole in our heart when they go but Teddy was well loved and I know he is looking down and celebrating you! Have a beautiful birthday, full of wonderful memories that fill your heart with smiles. They never go away…. Rejoice anticipating the wonderful year ahead. Thank you for the joy you bring to all of us who you share your life with weekly. HAPPY BIRTHDAY!!! Your blog is better than a beautiful magazine. There are beautiful pictures and ideas to inspire…..and a spirit that shines through coming from your voice in the written words. Happy Birthday!! Happy Birthday Tina! This post started my day with a few tears, but tears are a small price to pay for the love and companionship we receive from our fur children. My standard poodle Remy sends you love, a wag and a warm smile for your birthday. Happy birthday Tina. I miss your Teddy too. Tina, I cried when you told us about Teddy — he was truly the king of the castle. Today I wish you a birthday warmed by your memories of Teddy and filled with family and friends. Please remember that you can never replace Teddy, but you have love enough to give a beautiful life to another dog(s). Thank you for your lovely blog and sharing your creative gifts with us. Happy birthday Tina! Teddy lives on in your heart and will always be there with you. Thank you for sharing him with all of us too. 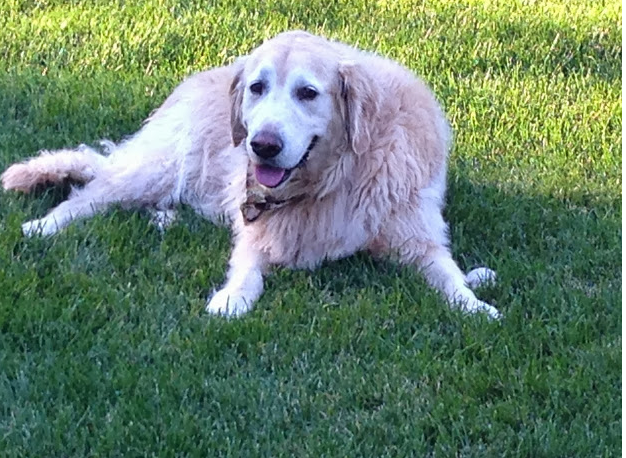 He was such a beautiful doggie and was very lucky to have you for his mom. From the looks of these photos, he clearly loved you as much as you loved him! Warmest wishes for a wonderful birthday, Tina! Your posts are so heartfelt. I know Teddy is looking down from heaven hoping you have a special day! Happy Birthday Tina~may your heart be filled with sweet memories of Teddy today and everyday! Happy Birthday!! Thank you for the all the love and beauty you share with us. I appreciate learning how to put things together and being inspired by your creativity. I hope you have a wonderful day! It’s a snow day here in Michigan and as a teacher, nothing could be more joyful! I turned 60 this week and I have been saying it in my best Jimmy Fallon voice-EWWWW! We lost our 14 year old Bull Terrier Sally recently-yep not over that yet. I put her pretty dog bowl out in the yard with bird seed, she loved the birds. Happy Birthday, you are only as old as your homes design scheme! No prob here! Enjoy! Happy, Happy Birthday, Tina! Teddy sure was the best birthday present ever. 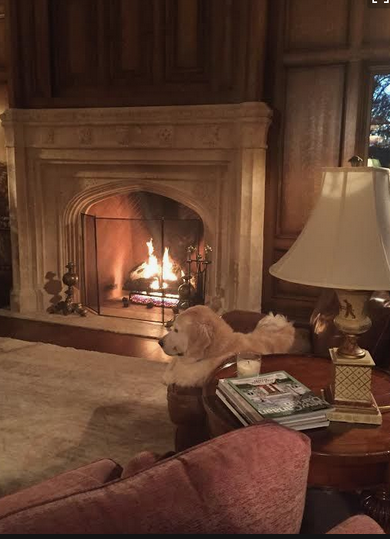 My all time favorite photo that you’ve shared is the one where he is sitting on the cozy chair by the warm crackling fire. He was so loved!! Enjoy this very special day. You deserve it! Happy Birthday, Tina! I hope you have a wonderful day, filled with special memories. I hope you will eventually love another puppy. I have gone through this sadness, too. Remember, grief is the price we pay for love. It is a small price to pay for the many years of unconditional love that our dogs give us every single day they are with us. Wishing you the Happiest of Birthdays! Many more Happy & Healthy Ones! Love the pictures of Teddy. We all feel his lose. When I first came across your ad in a magazine, I fell in love with the sketch of you and Teddy. I knew I wanted to know more about the Enchanted Home—and you did not disappoint. Enjoy your special day. Hope the snowy weather doesn’t sideline your plans. Happy Birthday! Enjoy your day and may the year ahead be filled with blessings! Have a happy blessed birthday, surrounded by family, friends and much love! 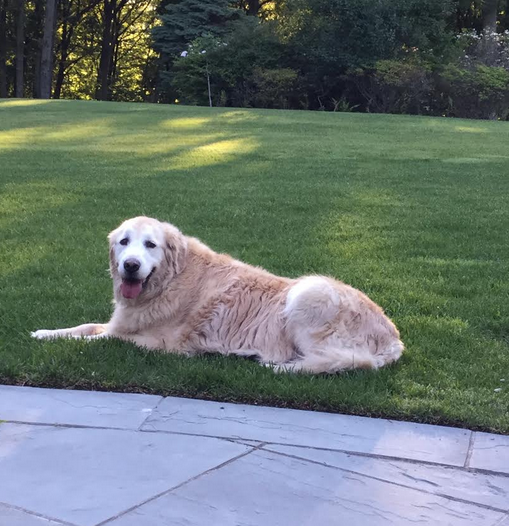 Thank you for sharing the pictures of your beloved Teddy, he was so handsome! You are such a wonderful inspiration! May today be your best ever! Happy Birthday! You were so lucky to have had Teddy in your life for 15 years; what a beautiful boy. The Happiest Birthday Wishes to You!! May you have a blessed day with those you love ❤️ and remembering your sweet Teddy! May the blessings of this “special day” outweigh the sadness you feel today. Wishing you a Merry Christmas from the South! Happy Birthday and thank you so much for sharing your life through your beautiful blog that inspires so many. Merry Christmas and Happy New Year to you and yours. Hope you have a very Happy Birthday Tina! First, Happy Birthday! I can empathize with your loss of Teddy; my Labrador Daisy will be 12 in February and I think often about “the day” when her unconditional love will no longer be with me. Thanks for sharing your lovely Teddy memories. Happy Birthday, Tina. Enjoy your lovely snowy day. I hope that soon you can feel it in your heart to the gift of love to another furry friend and understand that the heart doesn’t replace a loved one, it just expands to make new room for another just as you can love more than one child! There is a little dog out there deserving of love and a forever home. Happy Birthday Tina! I felt Teddy’s beautiful spirit from this post. May you celebrate this joy the whole year! Happy Birthday! The pure unconditional love of a dog is like no other. Tina, I always look forward to your post. It brightens my whole day. You are such a giving and sharing person. I know it must take alot of energy and dedication to do all you undertake. I am also very much an animal lover. I have a beautiful springer spaniel who has given more joy. I know Teddy will always be in the hearts of those that saw him. He was such a handsome fellow. Have a very happy birthday and enjoy all those memories that he gave you. Happy Birthday!! May your day be filled with love, fun, and laughter. Teddy was a treasure! Your pictures of him always make me smile! Our pets are our family and fill our hearts and homes with love and joy. We miss our Duke and understand your loss. Happy Birthday- enjoy your day in NYC! Thanks for sharing your Teddy with us! Happy Birthday! I hope you have a fabulous day! Thank you for sharing your wonderful home and inspiring us. I know it is no small task. Many of us have had a “Teddy” too, so please know how much we understand and share in the joy of your memories of him and how we know someday we will reunite, once again, in Heaven, for all eternity. Merry Christmas, too!! Happy Birthday Tina! Have a special day! I really get it. I lost my precious 13 year old King Charles Spaniel this year (2 Days before my Birthday.) I also cried as I walked past the dog treats and outfits at Target. 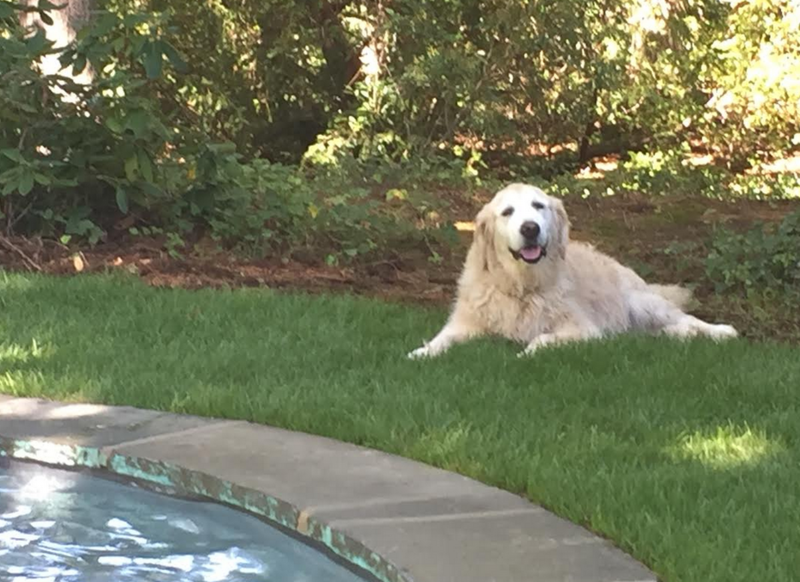 And like you, after having a special dog in my life for 30+ years, I am going to take a break, too. Thank you for sharing your blog with all of us! What a treat to open my email and find a new update from you. Merry Christmas. I will be thinking of you. Happy Birthday, Tina!! A day in the city sounds like a great way to celebrate. May the year ahead be filled with wonderful blessings for you! We lost a cherished dog this year too. She was a standard poodle, and her name was Phoebe. I think of her every day. We bought a puppy a few months later, but we still love our poodle. Happy birthday to you, Tina. Your blog is always a bright spot in my email box. I hope you have a wonderful day. We too, miss your sweet Teddy. I lost my nearly 17 year old kitty a couple of months ago and my 20 year old cat is definitely feeling her years. These were my kids’ cats growing up and losing them is like my kids moving out all over again. A reminder of the march of time. Thank you for always finding the beauty in life and sharing it with us. Happy Birthday Tina. Our dogs have a special place in our hearts. Happy birthday, Tina! Another beautiful post. I too lost my amazing Wheaten Terrier, Bailey on Oct. 30 of this year, so I can totally relate to the way that you miss Teddy. Not a day goes by when I don’t think of our sweet dog. Hopefully they have met each other and are having loads of fun playing! Have a beautiful day, Happy Happy, Birthday. I love your beautiful blog and read it daily! Happy birthday …. and you will see teddy again! Happy Birthday, Tina!! Teddy will forever be in your heart!! Enjoy every moment of your special day! I hope you have a fabulous day and happy, healthy year ahead. I hope that the paw prints Teddy has left on your heart and the memories will provide solace and comfort in the months to come. Celebrate the blessings he brought and how much richer life was because of him. Happy birthday! But thank you for the gifts that you give us. You are an inspiration . . . Happy birthday, Tina! I hope the coming year will be one of your best yet. I have a feeling Teddy is celebrating your special day with you. Thanks for letting your readers get to know him. He added a lot of happiness to the world! A beautiful tribute to a beautiful friend. I know that time will replace tears with smiles as you remember your dear Teddy. Happy Happy Birthday Tina! I wish you a beautiful day. As to missing Teddy, it’s a true tribute to your best friend for the wonderful 15 years he gave you. One day (it took me 12 years and wasn’t planned) another sweet friend will come into your life and you will have the companionship again. Until then, it’s okay to grieve and to laugh at the funny things they did, to smile when you see something that brings up a memory, or to cry when the mood strikes. Be blessed. Happy birthday Tina. What a beautiful tribute to Teddy who was obviously loved very much. We lost our two pugs 2 years ago (6 months apart) and I felt numb for months. It was very hard for me, but then 6 months later found out I was expecting a baby so God takes but he also gives. I hope your birthday is fun and you get to do exactly what you want, you give to so many in so many ways, I hope this day will be all about you. Wishing you many many more, and love your inspiring, positive and beautiful posts. A beautiful tribute to a beautiful friend. I know that time will replace tears with smiles as you remember your dear Teddy. Happy Birthday! All I can say is I cried! Happy Birthday! Happy Birthday, with warm wishes on a cold day! Happy Birthday to you lovely lady, and I am sure Teddy is missing you just as much, and wishing you a wonderful day too. Happy, happy birthday!!! My birthday is tomorrow and each year as I live on the Earth one more year I feel more like celebrating those around me rather than myself! What a gift Teddy was!! I read your blog everyday and can’t wait to see what picture of Teddy you have posted. Love to you and Teddy. What a wonderful day to celebrate you! Happy birthday Tina. Wishing you all the best today and every day! Happy Birthday Tina, I receive a gift from you every time I open your blog. I love your shop and your beautiful home and the ride you take us all on. Enjoy your birthday 🎂. I always so enjoy your posts, especially Sven On Sunday! The loosing of a beloved pet is like loosing a child and just heartbreaking. I totally understand your hesitation for another and still feeling the weight of the sadness of Teddy’s passing. Have a wonderful Birthday in NYC! Hope you have a wonderful day filled with people who love you. I lost my dog six years ago and still think of him every day. Luckily, you have so many good memories and pictures to help you remember Teddy with a smile. Happy Birthday, Tina. I hope you have a wonderful day celebrating blessings and life. Thank you for sharing Teddy with us. He was such a lucky guy to have received the love and attention you all bestowed upon him. In return, he brought love and loyalty to you all. Tina wishing you a wonderful Birthday and a healthy happy year ahead. Happy Birthday to you! The wonderful memories you have in your heart will keep you warm through this cold New York Day…. Tina, enjoy being 53 ! You are still young. Teddy memories you share are sweet. I feel the same with my yorkie and dread her leaving me. Have a wondeful day! Happy Birthday TINA. Hope you have a wonderful day and that you spoil yourself. Memories of Teddy are helping you even though it is sad. I am getting tears in my eyes just thinking of your sadness but we both know that only more passage of time will help. Enjoy your day! You deserve it! Aww.. made me teary! Dogs are the best and I totally get it when you say you are not ready. All in good time. You will know. Make this birthday the most memorable of all- well until the next one! Happy Birthday, Tina. We all miss Teddy, too! Happy Birthday, sweet, charming Tina. Your tribute to Teddy made me weep. I hope you have a wonderful celebration and a great time just being 53! Happy Birthday…wishing you the joy you bring to others! The happiest of birthdays to you; it has been 4 years since I lost my beautiful Mia and I still miss her so your post really resonates with me and many others I’m sure, thank you. Happy Birthday, Tina! I hope you have a special day and a wonderful year ahead. I’ve been following you since you’ve started blogging, and you are one of my special virtual friends. You’re compassionate and so generous, and I always enjoy looking at those wonderful pics of your flower arrangements and how you decorate your home. You are blessed! I know how much you miss Teddy – I also cried with you during that difficult time. Thanks for being you! white bedroom. So glad I can wash often, but would not change a thing. Hope you find another furry best friend soon to help heal your broken heart. Happy Birthday, Tina! I loved your Birthday tribute to Teddy! Like you, I miss my loyal friend and smile-maker, Mugsie. Although it’s been eight years since Mugsie passed, my husband and I continue to greet him when we come home from a trip: “Mugsie, we’re home”! Dogs help to create the soul of a home and family. beautiful blog. So inspiring. Thank you for sharing Teddy with all of us, the pictures are a dear reminder. Happy Birthday, enjoy your special day. Each day is a gift. Happy birthday Tina….the bigger the love, the greater the loss. Another dog will not be Teddy, but will benefit from all the love you will be able to provide it. My Abbee has been gone for fifteen years. The years I spent with her were the best years of my life. After reading your post, I know it’s time to find another miniature pincher to fill the void. He will always be in your heart. Happy Birthday. Wishing you the happiest birthday ever. There’s a light dusting of snow in NYC like icing on a birthday cake. Enjoy your day! Enjoy your birthday. What a great photo tribute to Teddy. Weeping for your loss. Such unconditional love that is shown by our dear pets. Mine gave me more love than most humans, except for my children. Happy Birthday:) Hope 53 will be a great year for you and your family. Hi Tina, Have a blessed Happy Birthday!! Your Christmas decorations look gorgeous!! Happy Birthday to you! Hope your day is filled with happiness,friends, and lots of sweet memories of Teddy. Thank you for letting us share a bit of your daily life, and your gorgeous home. Now go out and celebrate 53 is a great number! Happy Birthday, Tina. I wish you health, love and happiness throughout the new year! My daughter was just married in November and her birthday is December 24 and I would love to surprise her with the birthday box. Happy birthday Tina. Hope you have a wonderful day and know how hard it is to lose a special friend like Teddy. We had two golden retrievers and both times, it was heartbreaking to say goodbye. They are the best pets you can ask for and I know what you mean about not wanting to go through that loss again. We got our second one since we still had a young child, but after losing her, we said never again could we endure that loss. Enjoy your day in NY! I wish you a very HAPPY BIRTHDAY and that you never lose your wonderful memories of Teddy. Happy Happy “Christmas Time” Birthday! Many Blessings as you celebrate your day in the city! Enjoy all the festive lights and trees, so much fun, it will definitely put you in the Christmas spirit for your holiday party this weekend!!! Teddy will always be in your heart!! Happy Birthday Tina. I enjoy your blog and your “style” and have learned a lot from you. I always appreciate how you present yourself with such enthusiasm and optimism!! My wishes for a another wonderful year of health and happiness and our privilege of sharing in your world. A very Happy Birthday Tina. I also miss your Teddy. I always look for the photos at the end of your post. Brings me to tears. I am sure he is no longer in pain and waiting for you! You will surely see him again and it will be as if the two of you were never apart! Best wishes for a wonderful birthday, Tina. And thanks for sharing your thoughts and memories of Teddy. I know he is celebrating with you today. I miss him too Tina, thank you for sharing him w your followers all over this great country. I really love all the pictures of him, dressed up or not, he was just an angel. Please keep sharing his pictures, I love all of them! Happy Birthday Tina! Many blessings in the coming year to you and your family. Thank you for brightening up each day with your beautiful posts! Remembering Teddy and the happiness he gave you is special. He’ll always be in your heart! Happy Day! Happy Birthday dear lady!! I turned 53 five months ago and it didn’t hurt one bit!! Thank you so much for sharing your life with us. I live on a farm in Central Missouri, and our lives couldn’t be more different! But I love seeing all the pictures and getting to enjoy the “East Coast” life from afar! Anxiously awaiting the “tour” of your new PB home. If I lived closer I would be incredibly rude and invite myself over for a cup of tea!! Blessings to you and your family and ENJOY YOUR DAY!!! Happy Birthday and I know that Teddy celebrates your day with love and joy. His loving spirit is forever. I too am not ready to fill that hole . Oh what sweet pics of Teddy. You may not be ready now but when you are you’ll certainly know. I got my Bagheera when our fourth and last child went to college four years ago. She made my life transition so much easier! Happy Birthday and thank you for all the lovely blog posts. Happy Birthday Tina….I never realized getting old could happen so fast!!! Enjoy every minute!! My husband and I are in the fourth quarter(football fans will understand) or sometime we call it the 2 minute warning….Our dog Sandy looked like your Teddy…She passed away at the age of 14…She is still with me…and I still talk to her… we have 4 children and she was with me all the way..unconditional love…and those followers who have daughters know how important it is to have that unconditional love…in hard times…Enjoy the day! hour! minute! second! Happy Birthday Tina. May God grant you many years. My heart goes out to you over Teddy. He is celebrating your day. Tina, Happy Birthday to you! I’m so happy to know you are celebrating a day with my very special sister who was diagnosed with metastatic breast cancer three years ago. With out the God given knowledge and skill of her doctors, this year would be very, very different. I’m sorry you are feeling the loss of your precious buddy today, Tina. I’d like to think Teddy would want you to celebrate a happy birthday and dance like no one is watching…Just don’t get arrested! I’m so blessed to have you and my sister in my life. Many happy, healthy days ahead. Happy Birthday! Such a sweet post! Happy Birthday, Tina! Wow! you got it right about gifts of family and friends, health and wellness and joy to surround us during our lifetime! May those gifts be yours forever, girl! Teddy is barking his version of “Happy Birthday to You” right now…smile! The happiest of birthdays to you! Teddy was so precious and i know you miss him dearly. What a beautiful dog and a beautiful family. Thanks for the lovely post. Such sweet pictures of Teddy. Have a great birthday, Tina. You are right, there is much to be thankful for! Happy birthday dear Tina! I’m sure your day will be wonderful and filled with joy! Happy Birthday! I am a dog lover too and I feel your pain. It is such a void when they leave us. Happy Birthday Tina, and have yourself a perfect day in the city! It is very difficult to deal with the loss of a family member, and I am sure that’s what Teddy is. 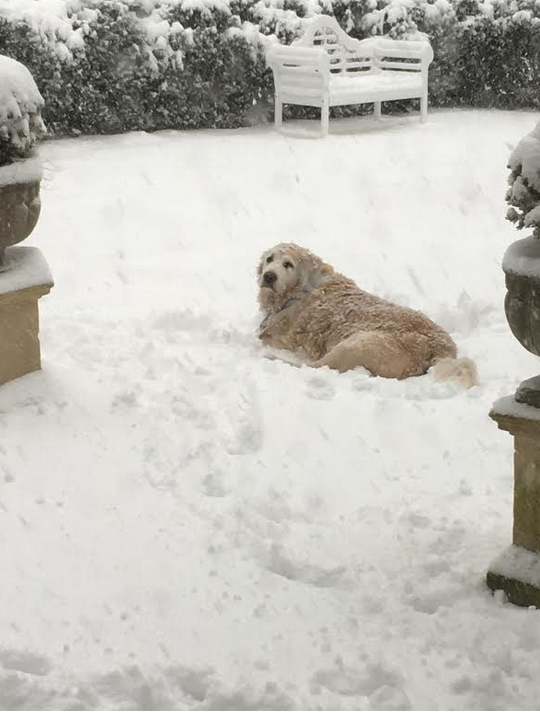 I love the photo of Teddy wearing snow and ice as a coat because it is evident by his eyes that he is a good soul and faithful friend! Do it big in honor of Teddy, he would have loved for you to do something special, you work hard by bringing so much joy to so many- glad you are taking the day off and doing something fun and for you. Teddy was adorable and very loved, I know he is looking down on you with an extra big smile today. Happy Birthday! Every time I see a picture of Teddy, I tear up. Just from the things you’ve said, I feel like I know him. They give tons of pleasure while they are alive, but when they die, it’s heart-wrenching. Happy Birthday dear lady and have a very special day. Although it’s been 20 years since we lost our Jingles, I still remember how gut wrenching her loss was. But also remember all of the happy, good, loving times. My husband and I have lost several of our furry children over the years. Each loss seemed to be even more devastating. Five years ago we lost our brother and sister shihtzu. It was so heartbreaking. I have such empathy for you . Every time you write about Teddy … it reminds me of how broken-hearted I was each time. When our last beloved furry children passed away.. I vowed never to get another because I felt I could not handle the sadness. I waited a year and then I started to yearn for another furry child to take care of. My husband and I picked out a little boy shihtzu who we named Beau. We picked him up in a baby receiving blanket and my heart was full. It is the best thing we have ever done. We love him so much. He will never replace our lost ones but we love him so much in a different way. I know you will know when it is the right time. Happy Birthday, Tina! Teddy was so handsome. After many years, I’m getting a puppy for Christmas! Take your time. 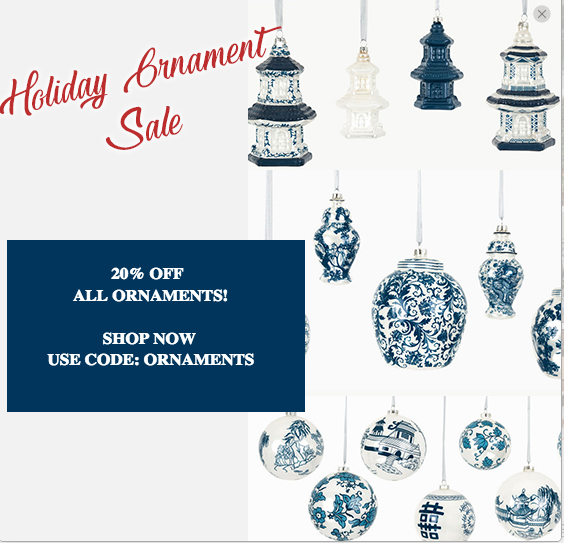 My blue and white ornaments look amazing on the tree. Thanks so much! My golden has been gone for 6 years, and I haven’t gotten another. I know how you feel. That said, you seem to be a happy person who brings joy and beauty to others, just as Teddy brought happiness to you! Happy birthday and Merry Christmas! Wishing you a happy birthday! I understand how you feel about your sweet Teddy. Our sweet Max crossed over rainbow ridge last year. We now have a very sweet little girl, Laila, who is making us laugh at her antics. We never can feel loss if we did not love and I know you loved your Teddy a lot. Relax today and enjoy the love around you. Have a wonderful birthday-celebrate the memories! I wish you the happiest of birthdays Tina! Dogs bring us an endless amount of happiness expecting nothing in return. Our lives are so much fuller because of them. 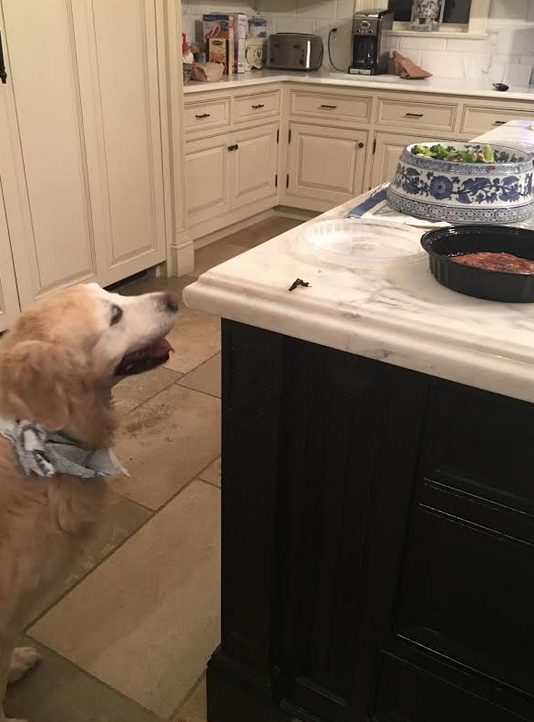 Enjoy all those treats in dog heaven Teddy! You made me cry.I have a Teddy of my own an hate to see the day he is getting ne. Happy Birthday, Tina. I hope your day is one filled with friends, family, and love. That was a lovely tribute to Teddy, who I know you miss terribly. Sometimes, in our lives we are fortunate enough to get a dog that understands us, better than anyone else. And, all they want in return is to be loved. It seems like Teddy was that for you. I hope in the future, the hurt will lessen and your heart will be filled with peace and your memories will be filled with the unconditional love that he gave you. Blessings to you and your family this holiday season. Happy happy birthday, Tina! Enjoy your day and this beautiful Christmas season. Happy birthday day Tina! This is such a sweet post. Teddy was a beautiful dog and he always looked so happy. Munchen my pup that passed two years ago was the best Christmas present that I have ever received and like you I still think about her and cry. That means that we were very loved and they were as well. I hope that you have a wonderful day. You are a very special and wonderful lady and you deserve the best this year. Happy Birthday Tina! I am sure Teddy is with you everyday, forever and always. It’s my birthday too! Enjoy your day! Happy happy Birthday!! So sorry your adorable Teddy isn’t there to share it. Wishing you a very happy birthday, Tina! Have a wonderful time in NYC. I love seeing those pictures of Teddy. Thanks for continually sharing him with us. Many blessings in the coming coming year. I know your heart break, but what a gift to another animal to have the love you have for Teddy. So many shelter animals need that love. Happy Birthday…. ahhh, sweet Teddy! Happy Birthday, Tina! What precious memories to treasure always! Happy Birthday! Your Teddy sure was handsome. I feel your pain about Teddy. There is nothing like the love of a sweet dog. He will always have a place in your hear and your family, and eventually, you will be able to think and talk about him without hurting but with happiness and fond remembrance. Happy Birthday! Have fun in NYC! A dog is a member of the family. I’m can understand the sadness of missing your sweet Teddy. Have a wonderful birthday! Is it better to have loved and loss or not to have loved at all ? Happy Birthday . I enjoyed seeing Enchanted Home in House Beautiful this month . Happy Birthday Tina and I wish you many many more. I think most of us will shed some tears for Teddy today, he was loved by many who never got the chance to meet him only see him through your eyes and your camera. Happy birthday Tina! Teddy was one of the best, we can tell that from your blog. He had a wonderful life! The longer you wait to bring a new bundle of fur into your life, the more days you can count without that special love and loyalty a truly good dog can bring. Not to mention what a good Home you will give to another sweet deserving dog. What a lively tribute to your beloved Teddy. Those memories are a treasured gift. Have the most fabulous Birthday! I love your posts. I am a dog lover too and I had to put my Boston Terrier down, it nearly killed me. This was several years ago and I still cry when I think about him. I love the pictures of Teddy it makes me happy to see them.Merry Christmas. Tina, my birthday was yesterday the 13th, and my pets, both present and past were pure gifts of joy and love. So sad when they are gone, but pictures help to keep their memories alive and your pictures of Teddy do just that. Happy birthday, Tina. You can see the love and adoration in Teddy’s big brown eyes. He knew he was well loved. Happy Birthday, Tina!!! Mine is tomorrow! Happy birthday, Tina! Thanks for sharing Teddy with us. I have owned two wheaten terriers and lost my last one 4 years ago. I’m just now thinking of getting another. It takes time. Enjoy your day and best wishes for another happy and healthy year! The happiest of birthdays to one of the loveliest of ladies. When the time is right, another Teddy will come into your life. Give yourself time. A very Happy Birthday to you, Tina! Thank you for taking your readers with you on your adventures. I enjoy all your posts. Hope you have a wonderful day. Happy Birthday Tina and may you have many many more. Happy Birthday to you! Thanks for sharing precious Teddy with us. I know this had to be a difficult post to write and rest assured that those of us who really love our dogs totally understand. Happy Holidays! There is nothing better in the world than “Puppy Breath”! Even when the puppy grows up, so much love is received from the family pet. In my case (widow) Teddy Bear, my 17lb Yorkshire Terrier, is my man to come home to! He is the one I sleep with and take for long walks. Happy Birthday and the memories of your “Teddy” are priceless! Happy happy birthday Tina. I hope you have a magical day in cold NYC. I know how much you miss Teddy. He is probably looking down on you and smiling. Merry Christmas to your family as well. Happy Birthday, Tina!!! May you have a day filled with love and memories of the past, enjoy!!! I understand your pain because we have endured it many times during the 49 years we have been married. After our last Cavalier King Charles Spaniel had to be put to sleep I told our vet I would never get another one and he laughed because I said it would have to be just dropped in my lap. Without going into the long details that is exactly what happened through Cavalier Rescue. Even though I still greatly miss our last one, this new one has been wonderful. Hope you will be ready for a new one soon. It does help to relieve the pain. Happy birthday, Tina! Thanks for all you do to create a beautiful world. We miss Teddy too and you should definitely get another dog. There’s plenty of love in your heart for another sweet pet. Happy Birthday Tina! I love your Teddy photos! The tears were flowing as I read about your trip to Target. It brought back memories of the year I lost my sweet Caroline 😢. Wishing you the best this holiday season! First of all…Happy Birthday to you…hope your special day is filled with lots of love and laughter! I too have a very special golden, who we rescued from Tawain, just lost an eye and had a giant tumor removed. He is still a happy boy though, loves his car rides, major petting sessions and his treats and meals. Tina, have a fabulous birthday in NYC! Happy birthday Tina. Knowing the love And companionship of a dog is one of life’s treasures. We lost our puppy last February and I completely understand how you feel. Love this blog. All of your design and home is the same as I would want my home to look like. Happy Birthday! Happy, Happy Birthday and you are wished many more to come. Enjoy your special day and know you bring much joy and happiness to your loyal followers. Your blog offers a little bit of escape from the turmoil of the world. Each post offers something beautiful to look at along with inspirational words and encouragement. Thank you for sharing your beautiful home and I love shopping on your site. Have a great day celebrating with your family and friends. Teddy’s loss will always be with you, know that there are lots of us out there who have lost a pet and feel the same as you do. We get it! Time helps but they will always be in our hearts. Happy birthday! Happy birthday! And thank you for sharing Teddy with all of us. We all miss him too. Wishing you a beautiful Christmas and a healthy Happy New Year! So sorry for your loss Tina. I’m dealing with a 14 year old Welsh Terrier that I love so much. Time isn’t on our side but he will continue to have the best life I can give him until the end. Oh and happy birthday sweet lady! 53 is a great age to be. Best wishes! Happy Birthday Tina! I’m hugging my sweet Jake a little more today. Rest In Peace sweet boy! My heart aches for my cairn terrier, Daisy, so I definitely feel your heartaches for Teddy. Let’s celebrate your birthday, Teddy, and a future fillied with good health and joy! Happy Birthday, Tina ! Thanks for sharing your heart with us. Every time I see pictures of Teddy at the end of your posts my heart melts and I get a pang in knowing he is not with your family. I can certainly understand and it is precious of you to share your heart with us. Merry Christmas to you and your family. Happy Birthday! You are catching me! I wish to offer you some hope. We lost our Molly about 1 yr. ago, suddenly. I say I’m recovered but you really never are. But you find a place in your emotional landscape to put it all. Remembering will bring smiles and laughter. I loved her dearly, she was my best friend. I came across a picture on the internet that I swear is Molly!! I sent it to my boys. They couldn’t believe it either. She’s saying hi for the holidays!!! Please know Teddy is in your heart forever and peace will find you. Your heart won’t hurt. Promise. Still don’t have another dog though!! Merry Christmas and Happy Birthday. Happy Happy Birthday Tina!! Enjoy your jaunt to NYC. My birthday is on the 26th, and my present is my wonderful children who never fail to be with me on my day. Love them soooo much! Anyone who has ever owned a living animal, knows the joys and sorrows of loosing your best friend. They are the ones that are always happy to see us; our constant companions. In my opinion, they are the loving, giving and adventurous parts of ourselves, reflected in them. I hope you continue to post pictures of Teddy; He reminds us of the important things in life. Have a wonderful birthday! What a lovely remembrance. Happy Birthday. Happy Birthday, Tina! You bring such delight into so many people’s lives! I hope you know how special you are … and clearly special dogs have special owners! Happy Birthday! You are still very young and it’s all about attitude anyway. I agree our pets bring so much joy to our lives. I’m sure Teddy treasured you as much as you treasured him. Happy Birthday! Thank you for sharing Teddy with us. The wonderful memories we have of our fur babies truly helps to ease the pain when we lose them. Happy birthday! Your posts light up my every day! I hope you are spoiled rotten by your friends and family and that Teddy’s love is felt stronger than ever on this special day. I miss Teddy. I wish you a very Happy Blessed Birthday! Now we’re the same age. And, yes, when I look in the mirror somedays I laugh because I really do feel 35, but I don’t look it. I’m sure you do. Enjoy your day with a huge slice of happiness. Just this side of heaven is a place called Rainbow Bridge. When an animal dies, that pet goes to Rainbow Bridge. There are meadows and hills for all of our special friends so they can run and play together, restored to good health…. but the day comes when they suddenly stop and look into the distance. Their bright eyes are intent. Their eager bodies quiver. Suddenly they begin to run from the group, flying over the green grass, their legs carrying them faster and faster. You have been spotted, you and your special friends cling together in joyous reunion, never to be parted again. The happy kisses rain upon your face; your hands again caress their beloved heads…. And together you cross Rainbow Bridge…. 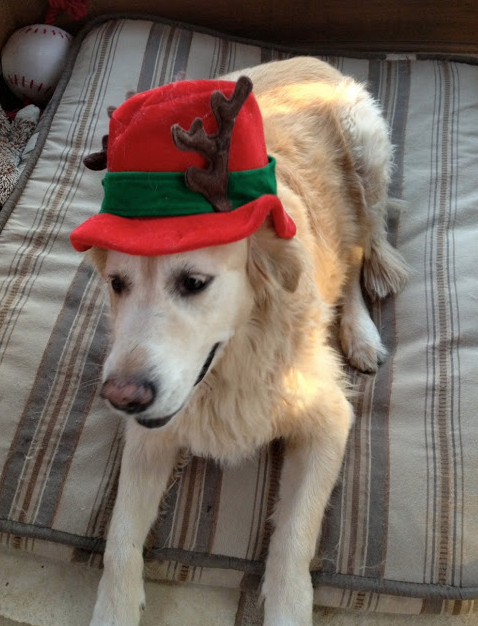 Our grand-dog Bailey died at Christmas three years ago at the ripe old age of 16 so I know how you feel. She was also a Golden and adopted by our daughter and son-in-law before they were married. When the children came along Bailey was so sweet and allowed the babies to climb all over her. She had a good life and we were blessed to have her in our family. I can relate to your heart ache! HB and happy holidays to you and yours! Happy Birthday Tina! Wishing you peace, good health and all the good things in life. I know just how you feel. We have lost two pets this year. I lost my 17 1/2 year old Maltese in July to kidney failure and my daughter just lost her 16 1/2 year old Shitzu to liver cancer this month. She is inconsolable and says she does not think she can go through that heartbreak again. I told her it will take time but she will need to open her heart to a new furbaby sometime. They give us such unconditional love. There is nothing like coming home and seeing the excitement and love you are greeted with. got excited every time she saw a male face or heard a male voice, then dejected when she realized it was not her Daddy. She would lay on his lap when he read the paper or across his shoulders on his leather chair. I now have a 3 year old peekapoo who is the biggest lovebug. She is so loving to everybody in my family and anybody who comes to visit–never a growl out of her–she will give you countless kisses. She is such a happy pup. She misses the Maltese. I am hoping my daughter will get a mini golden doodle for her to play with when she feels she can open her heart again. Hope you have a wonderful birthday. My husband used to say that any day you wake up on the right side of the grass is a good day. personality and we love him completely. I dread the day he gets old. It is not fair that dogs have such short lives. We always hang ornaments that were Gage’s or a pic of him as a puppy. So hang those special ornaments and think of him every day during this Christmas season as he brought joy and laughter to this special time of the year. I know mine light up my life. Wishing you a very Happy Birthday – enjoy your day! Happy Birthday, Tina………………as you have been reflecting on one of God’s blessings, please leave room for another when the time is right. You have been and are a blessing to many……………as each day your ” little light shines” thru your daily offerings. Happy birthday. Enjoy your day and hope it’s is the best year ever, with loads of love and good health. Happy Birthday! Teddy has received the best affectionated love you could give him, I’m sure you both enjoyed the time you spent together. There’s nothing I could say to make you feel better, just think that you gave each other a lot of love. Happy Birthday, Tina! I miss Teddy too, but loved seeing his pictures. Have a wonderful day! Tina, I feel your pain! I lost my two precious beloved pups, on the same day, four years ago due to old age and sickness, and there isn’t a day that goes by when I don’t miss them. There is an expression that time heals all wounds, but time does not heal the memories. They are my screen saver on my computer, so they greet me each morning with their beautiful faces. Teddy would want you to have a Happy Birthday, and so do I !!! Happy Birthday and Merry Christmas! Enjoy your day in NYC! FIrst, a very Happy Birthday, Tina, albeit a bittersweet one with Teddy’s passing. I, too, lost my pug Katie on April 1 this year, the same day we lost our pug Leo two years before. There is no day that goes by without me thinking of them and looking at their pictures. But, you are right – there are so many things to be thankful for. The ubiquitous presence of Teddy is gone but it remains in your heart forever. The saying is so right – true love never dies. Happy Birthday again. We lost our beloved Buddy who was 17 in August. Like you, I miss him everyday. Life is totally different now without our family’s special dog. Sending you many hugs! Congrats Tina on your birthday! I just had my big “6-0” a few days ago. While most would be less than happy of going into another decade, I can only be giddy about what may come….weddings, grand babies…!! My daughters are 25 and 31. Both in serious relationships that look like this is going to be a blooming good decade. It’s not as much what WE will be accomplishing but what our children will be adding to their lives which in turn enriches my husband’s and my life! I am blessed with fabulous daughters (if either was single I would be suggesting a set up with your sons…) This new year, you should be focusing in on fabulous Kodak moments at your new Palmetto Bluffs home!!! We are planning our move from Los Angeles to there finally!!! Love, love it! The girls are coming out in May with us to give us their blessings before we get started as they have never been there, only heard of it. Teddy was so very blessed with the best life a dog could have in their limited time here. He is up there in the “doggie park in the sky” with my beloved dogs of past. Maybe time to give another lucky dog the time of “their life”?? Happy Birthday Tina. On Nov. 20th I rescued a beautiful, white, standard poodle, named Ivey Rose. My hubby passed away a year ago and she has brought so much joy to me in such a short period of time. I can now understand how the loss of your longtime best friend must be so very hurtful. He must have had a “”wonderful life”. Happy Birthday Tina! Hope your celebration today is all you could ask for! Sharing your keen eye for all that is beautiful has been a great resource for many and albeit not an easy task, but also sharing your love for Teddy has shown us your heart! Have a wonderful birthday and a very Merry Christmas! HAPPY HAPPY BIRTHDAY! You share your birthday with my youngest child who is turned 27 today! She is also in New York City to celebrate today! I hope you have as much fun as she is having! Happy, Happy Birthday Tina🎂! I know Teddy is celebrating with you too ! May the coming year ease the heartache, sweeten the memories and be filled with happiness and good health. As always thank you for sharing with us your home(s). Best wishes Judy T.
Happy Birthday to you for today. I hope you are thoroughly spoilt! Thank you for your blog and sharing beauty,happiness and elegance in a world that is much better off for your contribution. What a sweet birthday remembrance of your dear pal. I just came home from the vet after my dear “pal’s” annual check up. She is getting on in years but came through with flying colors. I was relieved to know she is doing ok….chugging along like all of us. Enjoy your birthday and keep Teddy close to your heart. Have a wonderful birthday filled with light and love! Birthday Blessings to you Tina! May it be one filled with love, joy, health & happiness. Thank you for all the smiles, joy & beauty you have brought to us over the years, you are truly a very special & generous spirit. My heartaches for your loss of Teddy. I too have experienced such a loss and hold onto & cherish each & every memory. God Bless & Happy Birthday to you, Enjoy! Happy Birthday, Tina! I hope that you have a great day in NYC! I love your blog so much. I always take time to read all of your posts. I don’t want to miss a thing! I can tell that you still miss Teddy. How could you not? He was such a big part of your life. I am grateful for the pictures that you always post of him. Again, have a wonderful birthday. You truly deserve it! Happy Happy Birthday to you Tina!!! Our love for your pets in insurmountable, they are such a huge part of our lives. I love to read your blog and your instagram post. You are one in a million. Have a most lovely, enjoyable Birthday! And stay Warm. Happy Birthday, Tina! Wishing you a year of joy and love! Your words brought back the ache I have had ( less now after 6 years) after losing my Shelbie. I had a pain in my chest for weeks after she died. I know the pain of missing the best , most unconditional friend I have ever had. Many blessings to you for a wonderful day today – and a beautiful holiday season. And thank you for bringing beauty and inspiration to my inbox with every post! Happy Birthday ! Enjoy this day and those to come. I so appreciate your uplifting posts and beautiful photos. Bring an animal lover, I understand the bond you eastablished with Teddy and empathize with your feelings of loss. I recommend a book DOG HEAVEN by Cynthia Rylant. Have a joyful day! Our 14 1/2 year old Pomeranian “Grizz” passed a week ago today. My husband and I are heartbroken ~ he was the love of our lives. He died peacefully in our bed between the two of us. I see him around every corner, at times I can smell and feel his warmth. We have a little shrine with his photo, his collar, flowers and a candle. In reading your post today, I wept at every photo of dear Teddy, but it gives me encouragement to see, and we are filled with gratitude for the love and companionship that was Grizz for all these years. Christmas will be a challenge, as he, too, endured his little outfits and a visit to Santa. Wishing you a very Happy Birthday, and a Merry Christmas. Thank you for coming into my home every day. I wish you the happiest of birthdays, Tina! All of us with furry members in our families share your heartfelt memories. Oh my gosh, you can certainly see how well-loved Teddy was 🙂 Have a wonderful birthday today Tina!! Tina, wishing you a beautiful birthday. Yes, I think of you and your loss when I read your blog and see Teddy’s picture there. Just hope you do have a great day today. You are very inspiring to me. Happy Birthday Tina! Losing a family pet is never easy. Your photos of Teddy made me well up. We lost a beautiful black Briard a year ago. When it’s time, please believe me when I say a new puppy will bring you a new love. Enjoy your holidays. Your blog is my absolute favorite! Happy Birthday Tina! Wishing you many blessings today and the year ahead. Thank you for all the pics of Teddy! He was so very special! A very Happy Birthday, Tina. May all your birthdays be wonderful. And thank you so much for sharing Teddy with all of us. 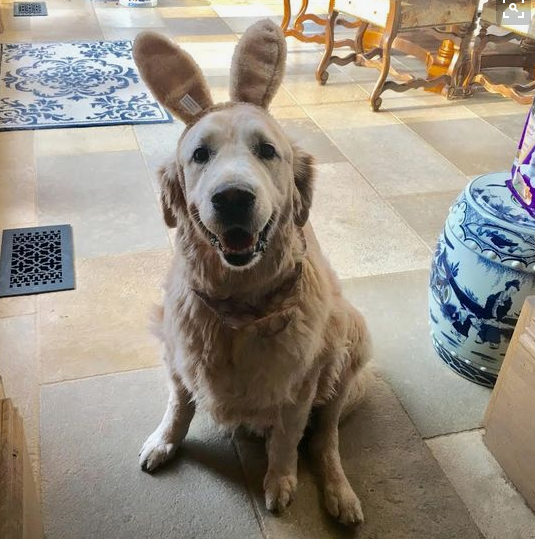 Goldens are one of my favorite dogs, and I really enjoy seeing his pictures. I didn’t know him personally. Happy Birthday Tina! What a sweet tribute to your Teddy. Hope your day is filled with all the comfort, memories, joy and love that is the part of your home that made his life and yours so precious. Happy birthday and thanks for all your lovely posts ! Happiest of Birthdays to you. Your Teddy was such a trooper and so cute. I started reading your blog just before he was hurt by some wild animals…I was so glad to see him recover so well. I’m sitting here by the fire with my 15 1/2 year old dog, Major. He’s been such a blessing to us as your Teddy was to you. Happy Birthday Tina, I love this post. Having put down a few dogs in my life I can relate. Hope you have a wonderful day. My best. Thanks for sharing Teddy with us! Many of us have four legged family members who become so dear to us and make life richer! Oh reading the pain you are feeling missing your Teddy breaks my heart. I love your pictures! Happy Birthday! Hoping you have had a great birthday! I can understand why you hesitate to get another. Happy Birthday from Oklahoma. Hope you are having a special day. Wishing you a very Happy Birthday! Know how much you miss your sweet Teddy- I’ m in a similar situation having lost my precious “George” so your post brought tears to my eyes as well. All of us that follow you grew to love Teddy as well- loved the pictures – He sure was a sweetheart! Merry Christmas to you and your family! Happy BIRTHDAY TO YOU!! 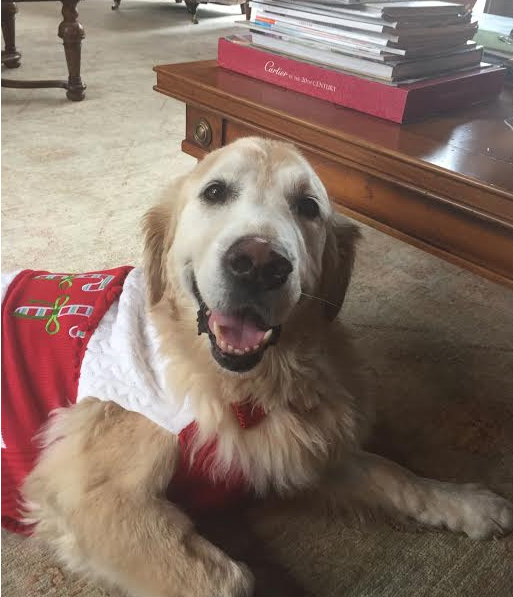 !I have a west named Sadie,14 years young,suffering with a collapsed trachea,her time is limited,the love that we feel for our pets is wonderful,and the unconditional love they give us,feel for you,so sad,he is at peace.Merry CHRISTMAS to you and your family. Ah, Happy Birthday Tina and many happy returns. Anyone who loves and spoils their dog is a hero to me! Have a wonderful day with friends and family. Teddy was a wonderful dog, friend, companion, family member.. Seeing him in those pictures makes ya just want to crawl in there with him and give him a big hug. I wish they had more puppy years and did not suffer at the end like they inevitably do and all too soon. Would that we, people and animals alike, could all just exit at home while sleeping. Personally, I’d like to check out while playing golf, preferably the 18th hole. What a lovely tribute. I have a a couple of retrievers as well and know how special they are. Happy Birthday I love your site. Happy Birthday and may all your days be filled with only happy memories!! Happy Birthday Tina and don’t worry all dogs go to heaven! What an awesome present Teddy was!! A daily gift of joy for you for over 14 years. I feel your loss,,,as I have lost 2 dogs in my life and will never again put myself through that gut wrenching pain. We are 7 days and 7 years apart…. Me being the old gal! Sending you Happy Blue Birthday wishes on your special day! Many blessings to you Tina. Teddy will always have a place in our hearts. Happy birthday! Wishing you a day of happiness and a year of blessings. Happy Birthday. As we age our birthdays reminds us of wonderful past memories, grateful thoughts for today and wishes for tomorrow. Our beloved pets are all part of those memories and gratitude that we had them.. Wishing you a Blessed year ahead. Happy Birthday 🎊 The magic of a birthday is to reflect on the love and joy of the year one has had and to celebrate a year that is to come. Thank you for sharing Teddy with us and the love you shared. Love, after all, is what life is all about. Tina, happy birthday! I lost my beloved yellow lab on aug 5 this year. He got me through 10 years of military service. I am right there with you every step of the long road towards healing. I am hoping to use all that he taught/gave me to give back to a dog in need of a good home when the time is right. Thank you for all your posts about Teddy! Have a wonderful day celebrating life. Happy Birthday! So appreciate that you can count your blessings in spite of everything. Love your Teddy pictures! Have a wonderful birthday! The years go fast so enjoy and celebrate each one! Happy Birthday! Enjoy your day at this very special time of year!! Have a blessed birthday. Tina take your time it took me almost a year before I got another pet after I lost my precious Panthere’ and my husband forced me to but I am so glad he did as I also love our new little boy and it took me a few months to get use to the idea . How glad I am he did so much joy in my life again. Love your philosophy of the glass being half full. Sending Birthday wishes that carry you thought this holiday season. Our dogs are like that, aren’t they? Part of our hearts forever. What a gift to have had a dog who so filled you with love and joy! Happy Birthday and thank you from the bottom of my heart for your wonderful blog, that I enjoy so very much! Happy Birthday! Thank you for your wonderful blog, sharing your life, heart, home, and love of beauty. Many more with health and happiness! Happy happy birthday Tina! I’m sure you’ll make it a great day! Understand about Teddy / I cannot replace my Bouvier Bear either – just impossible!!! A very Happy Birthday to you, Tina……I love that you chose to dedicate your post today to dear Teddy. The year we lost our fur-child, we decided to find an ornament of a schnauzer and place it on ur tree. We felt that though it would be a difficult Christmas for us, it would be twice as hard if we didn’t include her in some way. Just a thought to ponder ……. wishing you a wonderful day. Happy, Happy Birthday Tina!! Hope you enjoy your day! Best wishes to a celebrated birthday, Tina! The memories of our pets are always with us. They touch our hearts and are loved in ways we only understand as owners. We lost our 5 year old rescue this year and understand your hurt. One day, at the rainbow bridge you will meet Teddy again healthy and running. I love all of the dog outfits! You have perfectly articulated the devastating loss of a dog, who are such amazing family members. Teddy surely felt so loved. Tina, I hope you’ve had a very happy birthday! Wishing you a wonderful year ahead! Very Happy Birthday Tina! I have to say the way Teddy looked at you through your camera or phone, he adored you. You can see it in his eyes. You are right when you say he is doing a happy dance for you today and is watching over you. Thank you for letting us into the world of Teddy. Happy Birthday, Tina. Teddy certainly was a sweet, beautiful boy. I loved all the pictures. I am a dog lover,too. I was blessed to have five collies in my life . I have always felt these furry friends were a gift and were really Angels sent to look over us while they were on earth. My ‘”Boys”, were my best friends and I still miss them. A woman who bred dogs once told me that getting a new dog to love was the best way to handle the grief. I am not ready, yet. Your pictures and memories of Teddy have reminded me of how much happiness a dog friend can bring into one’s life. Thank you for sharing your thoughts. I have enjoyed your fond memories .Teddy was a special guy. My favorite picture of Teddy or any dog, really, is that last one you posted. It gets me every time. I love his little face. It radiated joy. You are lucky to have shared such a long time with him. Not long enough. Never long enough, I know. But years of memories and moments that etch into your heart. And he was lucky to have had you as his mommy. I love seeing his pictures – I never tire of it. Happy Birthday Tina – thank you for sharing your talents and your life with all of us. My husbands birthday is today also! I understand how you feel about your sweet dog. I lost my sweet Yorker earlier this year. Miss my baby too. She was a delight. Happy birthday, Tina. You are still just a babe!! I have almost 30 years on you!! The pictures of Teddy are precious, but I especially like the one of him in the red hat!! The joy, love and warmth you extend to friends, family and customers works because it’s who you are. Pure, unadulterated honesty. Lucky for us, Happy Birthday and Merry Christmas! Love all the pictures of Teddy! He was a treasure! Happy Birthday Tina, although I don’t know you I always read your emails and bought some beautiful things from your company. I am a dog lover myself owner of the four beautiful pekingese. So sorry to know about little Teddy. Happy Birthday and may you have many more to come. Happy birthday🎂… I so know how you feel about Teddy. This will be our 1st. Christmas without our Eve (we got her 14 years ago on Christmas Eve.). ❤️Breaking. Hope you had a great day! Wishing you the happiest of Birthdays!! 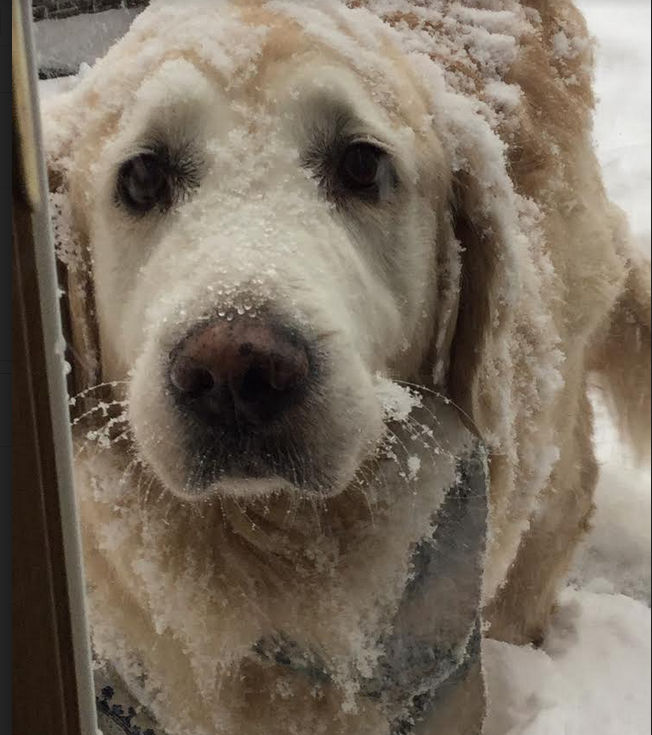 My favorite pic of your Teddy is that sweet face full of snow – this is a hard one Tina – all the “puppies” i have known and are gone are so embedded in our hearts the feeling of their loss is unlike any other. When i first come into the house, I sometimes still hear them jumping off the bed their tags jingling from their collars coming to greet me – and this is decades later – it will get better but the love of this special member of your family will live in your heart forever – have a happy birthday and a wonderful Christmas and thank you for inviting us all into your beautiful home and sharing your family stories with us. Hope your day was wonderful. It’s a gift to be alive and feel younger than you are. Happy Birthday, Tina! Thank you so much for sharing on your blog. Your loving heart shines through as you write about your beloved family and your dear Teddy. Wishing you many, many blessings. Tina, we ALL loved Teddy! When my dog, Lucy, passed I told my vet that I would never have another dog and go through this heartache again. He looked me straight in the eyes and said, “Lucy gave you more than 10 years of happiness and in return you experience heartache for months, but would you trade that?” No, I wouldn’t it. And now I have adopted Jake. He isn’t Lucy, but he is wonderful; a faithful friend, loving companion, and “Guard Dog”. Teddy would want you to adopt another! My heart breaks for your loss. Teddy had a wonderful life while on this earth and you and your family made that possible form him. What a blessing our animals are to us. Love to you for dedicating this blog post to him. Happy Birthday Tina! Keep up your positive attitude. Happy Birthday and many healthy and happy returns! May God Bless you, Tina! Thank you for your elegantly delightful blog! Happy birthday! So sorry that you are still feeling pain over the loss of Teddy. We lost our golden, ranger almost three years ago to this day. The kids were able to get home from college just in time to say good-bye. It was heart wrenching since Ranger was the center of our family. Christmas that year was miserable. But we did get two golden puppies that following March. They can never replace the Love we had for Ranger, but they bring us so much joy every day. So I would consider getting another dog if I were you Tina. You still have love to give another animal. He will never replace Teddy, but will fill the ache of your loss and soften that pain. Hope you had a wonderful birthday. Keep going strong! I really think you should get another dog. He would never replace Teddy, but you’d have someplace to focus all the love you want to give Teddy to another deserving dog. Happy Birthday! Many blessings for your new year, and cherished memories of Teddy. How wonderful that there is this marvelous human trait that allows us to share both the joys and the sorrows of life. It is a gift to be treasured as we continue to laugh and cry with each other. Happy Birthday Tina. Enjoy you day. Thank you for giving all of us so much great information, beautiful pictures, decorating tips, and merchandise. It’s fun to follow you. Happy Birthday Tina. I am a day late, but trust you had a fabulous day in NYC! What a sweet little angel! Thank you for sharing him with us and letting us be a part of your life through your beautiful blog. You are so right about how heart wrenching it is to lose them, but they bring so much joy to our lives and it is such a blessing to be able to rescue a little one and give them the love they deserve, which they give right back to us! Happy Birthday Tina! Bless sweet Teddy! Happy birthday to you!!! May memories of Teddy bring you joy like you brought him! Happy Birthday a little late…. hope your day was filled with love. We are celebrating the 4th adoption anniversary of our precious Retriever. Like Teddy she’s an absolute joy and has been my constant companion and “assistant”, always finding a place to lay nearby wherever I’m working. Animals bring such joy to our lives; they love us unconditionally, protect us fiercely, greet us with glee, and comfort us when we’re down. There must be a special place in Heaven for our furry friends. Thank you for sharing Teddy’s love with all of us. 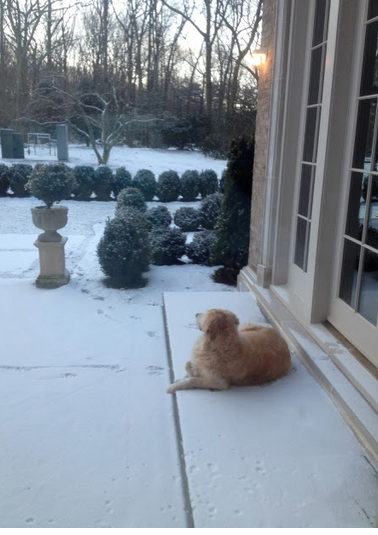 I miss Teddy too & am grateful you still post his pictures…he’s just so cute! Happy Birthday, one day late! My special pup died 2 years ago in October and I still miss him! We did, however, just get not one, but 2 new puppies! They will never replace my beloved Bucky, but they are so cute and sweet. I have to admit, I am loving it! Hope you and your family have a very merry Christmas! Happy Birthday!!!! Enjoy your special day!! I’m doing ” the ugly cry” while reading this beautiful post about Teddy.. Unfortunately, I know how you feel! We are lucky to have had such great dogs ! Thank you for sharing Teddy’s photos. They brought tears to my eyes too. He is a twin to my beautiful boy that we lost when he was 14 years old. On the last day he would see me, I remember him staring into my eyes, like he was searching and taking a memory with him. They are beautiful and gentle “Teddy Bears”. Hope you had a wonderful birthday and your tears turn to smiles every time you think of him. Happy Birthday Tina! Thank you for sharing your story of Teddy. I’m new to your blog and have absolutely fallen in love with your style, decor, and home! My favorite color is blue too! Happy holidays to you and your family! Happy Birthday Tina! I’m so sorry for your loss of your sweet Teddy. What a wonderful companion you had in him, besides him being such a good sport. So thankful you have such sweet memories to think about. Hope your Birthday was a happy one! I love the pictures of Teddy. Thank you for posting them and sharing your loving memories of him. Happy Birthday Tina!!! Thanks for sharing your wonderful pictures of Teddy with us. Your Teddy is our joy too! What a special post — you can’t help smiling! Happy Birthday to you! I love that dog! His sweet little face is so precious…so grateful you had so many good years with him! What a dear and sweet friend he clearly was! When looking at Teddy’s darling face in these pictures, it’s no wonder that the mourning and healing process will take time. What a blessing that you each had each other for 15 years. I wish you a very Happy Birthday! I hope your heart heals.. I unfortunately know that pain, but it does get better. Enjoy your day .. what a blessing you are to so many! Tina,,,, thanks for sharing every aspect of your life with us. All of your posts I so look forward to reading. Love that you always share a pic of Teddy also. Your writing about your deceased dog made you a “soul sister” in So. Calif! one with such a loving heart. After the holidays come and visit and get warm again. I have a wonderful old estate that would be excellent for story photo shoots. How we love our doggy friends…gosh, I was welling up reading this and looking at the pictures of Teddy (as the mother of an almost 11 year old collie). Our time with them is limited, and it sure is sweet! Thanks for sharing and happy birthday!! Dearest Tina! With all the “hussle and bussle” of the holiday planning, I missed your post for “Teddys” Birthday. Happy Birthday, Teddy! The tears roll down my cheek as I’m reading about your wonderful memories with Teddy. What an “unconditional” true friend he must have been. I remember when we had our beagle “Mikey” of nine years it was so tough to let him go. The loss was so raw for so many years. We said that we could never replace him. He added so much joy and laughter to our family. To this day, we still think of him and miss him. I know and understand what Teddy shared with you. My heart aches for you during these times; but think Teddy is no longer in pain and no longer suffering. He is up there in heaven having the time of his life. He has left you and your family a gift of LOVE of all the wonderful memories. Continue to write about Teddy, publish a children’s book. You have so many talents. I know it would be a best seller. A beautiful contribution you can give to Teddy of all your wonderful memories. A Treasure To Hold Onto. Peace and Comfort, my Friend. I love everything you do every day I read your’e blogs to see what new ideas and inspirations you have . I’m sure Teddy had a wonderful Xmas with all the other fur animals that left us behind. Greetings from South Africa. He was so lucky to have you. I’m sure he’s with you every day. What an honor to him to keep his bowls in his spot. I’m sure he loves looking down on his home. This is to sad.